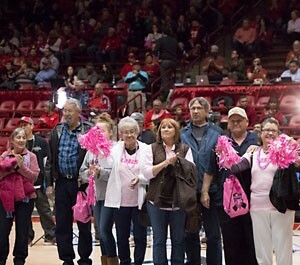 The UNM Men’s and Women’s basketball teams will hold their Lobos Love Pink! games during the same week to raise awareness for breast cancer and to honor all those who face it. in Dreamstyle Arena, 111 University Blvd. SE, Albuquerque, NM. To purchase tickets in advance, call the Lobo Ticket Office at 505-925-LOBO or visit unmtickets.com. Tickets are $5 for those wearing pink to the game and seated in bench rows 1 through 10.
on Wednesday, February 14, at 7:00 pm. Tickets are $10 for those wearing pink to the game and seated in bench rows 1 through 10.